Be the first to share your favorite memory, photo or story of Christopher. This memorial page is dedicated for family, friends and future generations to celebrate the life of their loved one. 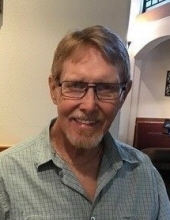 Christopher “Chris” Stuart Cassell, 63, of Peachtree City passed away February 3, 2019. Chris was born on July 22, 1955 in Atlanta to Glenn Cassell, Sr. and Dagmar Louise Anderson. He was preceded in death by his father; son, Stuart Cassell; brother, Glenn (Butch) Cassell, Jr. He is survived by his mother, Louise Cassell; sister-in-law, Janice Cassell; two nephews; two uncles, and a host of other family and friends. A memorial service will be held on Saturday, February 9, 2019 at 11:00 AM at All Saints Anglican Church, Peachtree City, Georgia. To send flowers or a remembrance gift to the family of Christopher Stuart Cassell, please visit our Tribute Store. "Email Address" would like to share the life celebration of Christopher Stuart Cassell. Click on the "link" to go to share a favorite memory or leave a condolence message for the family.